SALE!!! BLING!!! 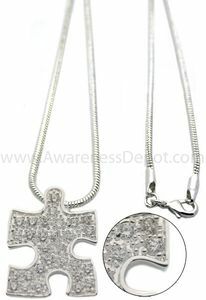 !Autism Awareness Crystal Puzzle Piece Necklace is an amazing piece to add to your wardrobe! This dazzling puzzle piece crystal pendant hangs on an 18in serpentine chain that is made of 90% white copper and then coated with a pure silver plate. The chain is thinly nickel plated for adherence of the white gold plate. Lead free. The charm measures 1" across and a little over 1" high. It is bright and shiny and gorgeous! Add BLING to any outfit with this great necklace. Charm measures ~1 in by 1 in. Chain is 90% white copper with silver plate.